Vanessa Strickland - Actor/Artist/Puppeteer: Frederick Gazette explores "A Clockwork Orange"
Frederick Gazette explores "A Clockwork Orange"
$5 Friday for A Clockwork Orange is TONIGHT! If you're in the Frederick area, come on by the MET, hang with our horrorshow street team droogs and kupet a ticket for tonight's show! Tickets are deng only (that is, CASH only) at the door and go on sale starting at 7pm when the box office doors open. No advance reservations, first come, first served! 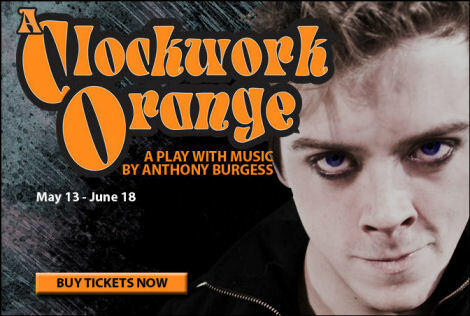 "This is what Alex and his droogs do for fun in 'A Clockwork Orange.' The Anthony Burgess novel and Stanley Kubrick's film adaptation that followed are notorious for their brutal depiction of violence toward women. It may come as a surprise, then, that two of Maryland Ensemble Theatre's [MET] main contributors to the company's stage production are female. Director Julie Herber and fight captain/ensemble member Vanessa Strickland have come to terms with the misogyny. Strickland, an Olney resident who plays some of Alex's victims, says that friends and family have questioned her involvement with the show. Some even made the decision not to see it. I couldn't be happier with how the article turned out and I'm hoping it gives some insight into our intention with this piece. Viddy you this nochy, then, doobidoob? Two Reviews for "A Clockwork Orange"